Scuba dive, jet ski, snorkel, try other water sports, golf carts, beaches, parks, museums, monuments, massage, mini-golf and more Put-in-Bay water activities. Tours and excursions on South Bass Island! From day trips for ferry boat passengers to longer tours in the historic buildings and monuments of Put in Bay. Beaches! Check out the island’s many miles of beautiful shoreline and scenic Lake Erie views. Put-in-Bay, Ohio… it’s a fun place to be; not far off either and convenient and happening. It has lots of options to do and spend some quality time. Water sports like any shoreline town, kayak, canoe, jet ski, rent a boat, parasail, and on and on. Or just lie in the parks and have a beautiful view of the mighty lake erie. Pool parties, sunday classic car parades, biplane rides… So much to do. Rent a golf cart for the day and you are set to explore the island. There is also a good variety of shops, pubs, and bars to grab a beer. Kayak at the Bay is located on Bayview Avenue down from the Doller Mansion and offers single and double sit-on-top and sit-in kayaks for cruising the Lake Erie islands. Whether you choose to stay in the harbor or go on an adventure around the island, you’re guaranteed to have a good time. Floats, water bikes, and ski tubes are also available for rent. Located one block from the Jet Express. Put-in-Bay Parasail is located one block from the Jet Express. 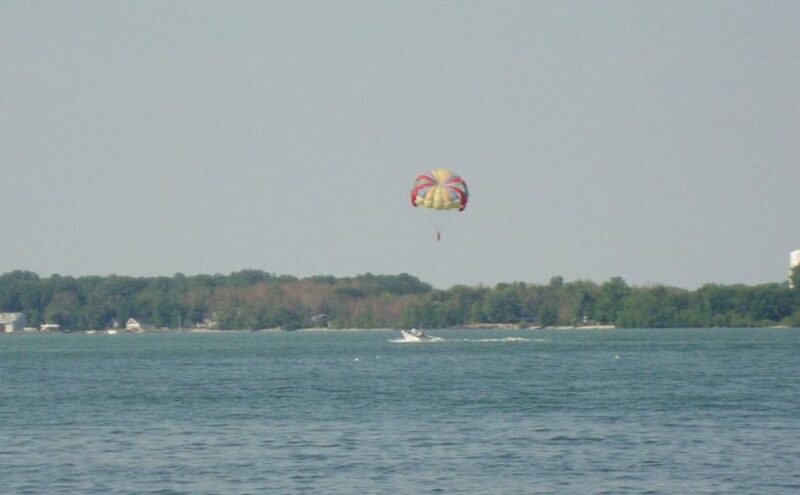 Parasailing is a great way to see Put in Bay. The parasailing headquarters is conveniently located by the Boardwalk on the docks. Enjoy the windy breeze as you tour the island’s beautiful terrace. By sailing from a 600 foot towline, taking off and landing on boats with flight decks allows you to remain dry. Parasailing is safe and fun for ages 3 and up, and no experience or athletic ability is necessary. Ferry service to Put in Bay Ohio… where the Jet Express Ferry ride can be half the fun of getting to South Bass Island Put-in-Bay. Relax and ride while enjoying a narrated tour of the history of the island. All-aluminum ocean-approved catamarans, the Jet Express are built in the USA. Traveling at speeds in excess of 40 mph the catamarans are among the fastest ferries in the world, yet the sleek twin hull design glides through all weather conditions with unmatched smoothness. Triple deck design provides beautiful viewing from an open air observation deck or from two stylishly appointed passenger lounges with tinted windows, carpeted decks and cushioned seats. Providing Early Morning/Late Night Service to downtown Put-in-Bay, board the Jet Express for the most convenient and most comfortable transportation to the island.